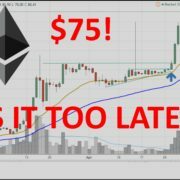 The last several weeks have seen extreme volatility and the recent selling in Ethereum is signalling caution ahead! It’s important to watch Bitcoin and Ethereum very closely as they are the leaders that have lead this rally higher so any selling in those two will be amplified by the other altcoins. The first crack appeared on June 15th when Ethereum dropped from $390 to a low of $260 during a rapid and steep sell-off before recovering. It bounced all the way up to $370 before making a lower top and then began to sell-off again but was supported by the moving averages. Then we had a market freeze on June 20th due to the Ethereum blockchain being clogged with ICO activity which led most exchanges to pause activity on ETH temporarily. 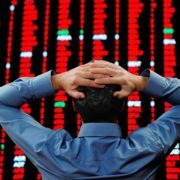 When the markets opened up again on Wednesday, we saw heaving selling in Ethereum which also spilled over to the others. We saw ETH trade down to $290 before bouncing again to $325. Then, yesterday we saw Ethereum begin selling off again on rumors that founder Vitalik Buterin had died. The selling was largely contained to ETH and the others held up well. However, the momentum was too strong and all of the other altcoins have seen big moves down today. Let’s look at some charts to see where things could be headed in the near term and intermediate term. 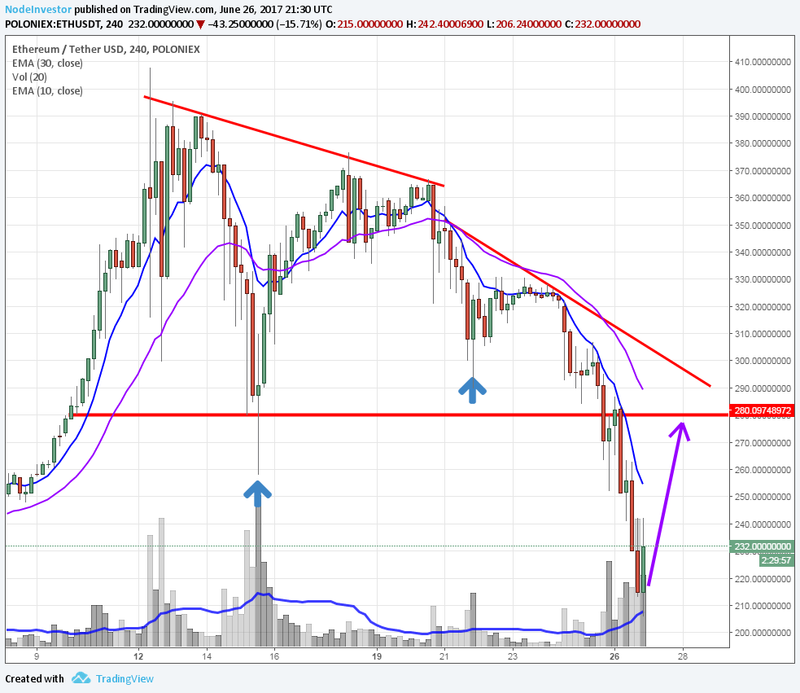 The concern with the recent action in Ethereum is that is has been making a series of lower lows. It had only been a warning until today and not much to worry about since the recent lows in mid-June had not been breached. That all changed today and we saw a swift drop that not only undercut all moving averages and recent support, but also went below the extreme low in mid-June around $250. 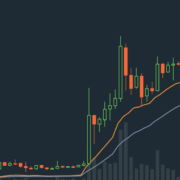 As you can see in the daily chart, we saw ETH drop to the low $200’s before bouncing today. It’s important to note that today’s low corresponded with the longer-term 50-day SMA as well as some support from late May. The only silver-lining in today’s action. Near-term, we are very oversold so I expect a bounce from here. 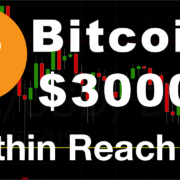 We could go as high as $280-$300 before seeing resistance again. The strength of the bounce will say a lot about what to expect from Ethereum over the next few months but ultimately, I see another leg down and more downside testing before the correction in ETH is over. This is just my opinion. The chart above is a closer look showing the 4-hour bars. 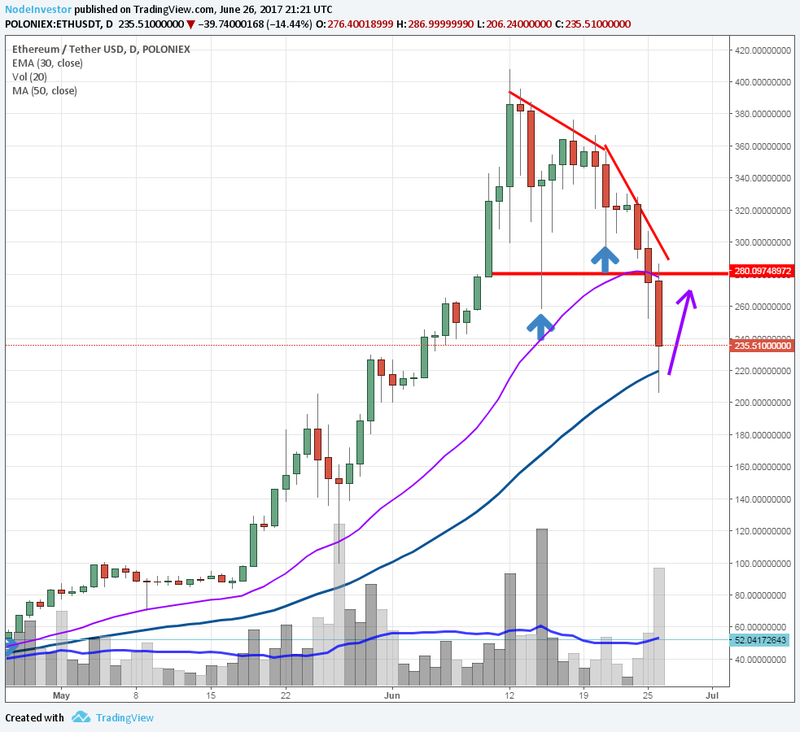 As you can see, ETH has been bouncing off the very short-term 10 period EMA and is now very extended to the downside. 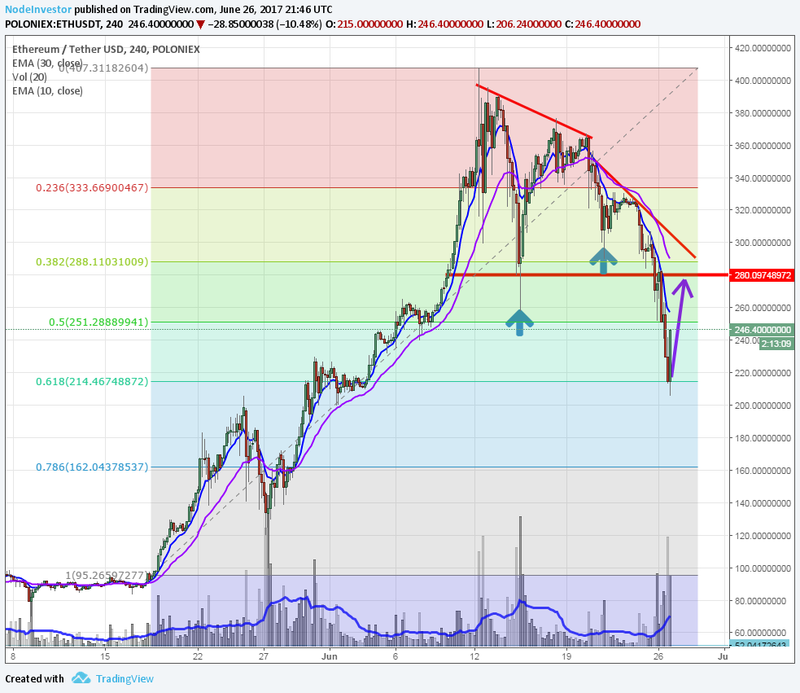 I believe a bounce is imminent but the test will be if ETH can recapture the $300 mark soon. We may have seen the final low today and perhaps ETH just bounces around here for a few months. That would be best case and would create a nice base for another run up later. However, the charts suffered heaving damage in recent weeks and a very big top is forming. I see more downside testing and sellers to show up before this correction is complete. If today’s lows do not hold, then the next level of support is around $140! I do not expect to see it drop that far but anything could happen and we could see a very brief flash crash again. In the chart below, the Fibonacci retracement following the breakout at $95 show that we hit the key ratio today at 61.8%. That is another positive sign for the near-term. Below that, the next level would be around $160. Well a lot depends on where you got in. If you’re sitting on a profit and didn’t sell before the break below $300, I would hold and learn more from the coming bounce. I’ll be posting a video soon looking at ETH as well as Bitcoin and others. Overall, I am of the opinion that at best, the market will pause here and consolidate the move from the past four months. At worst, we will fall further and see more selling in Bitcoin, Ethereum and others over the coming months. As you all know, longer term, I’m very bullish on Cryptocurrencies and Blockchain related assets. I fully believe the uptrend will resume and new leaders will emerge. There will continue to be opportunities in the crypto space we’ll go well beyond $100 Billion market cap. For now, you must be very selective on which one’s you buy into now. Caution is advised on any new purchases. https://nodeinvestor.com/wp-content/uploads/2017/06/ETHdayJun26.png 900 983 Node Investor https://nodeinvestor.com/wp-content/uploads/2017/04/NodeInvestor-logo1-300x170.png Node Investor2017-06-26 22:01:472017-06-26 22:01:47Did Ethereum just confirm a longer term down trend?